William Leslie was the son of Moses and Ruth Leslie. William Leslie was born in Castledawson on 24th November 1892. Moses was a farm labourer. William enlisted in Armagh. He was living in Castledawson at the time. Private William Leslie was serving with the 9th Battalion of the Princess Victoria's (Royal Irish Fusiliers) when he was killed in action on 16th August 1917 in Belgium. 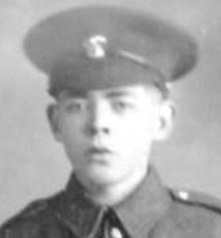 Private William Leslie has no known grave and is commemorated on Tyne Cot Memorial. It is believed he was the son of Mr Moses Leslie of Derrygarve, who had five sons who served.